Negroni and Netflix? Yes, please. 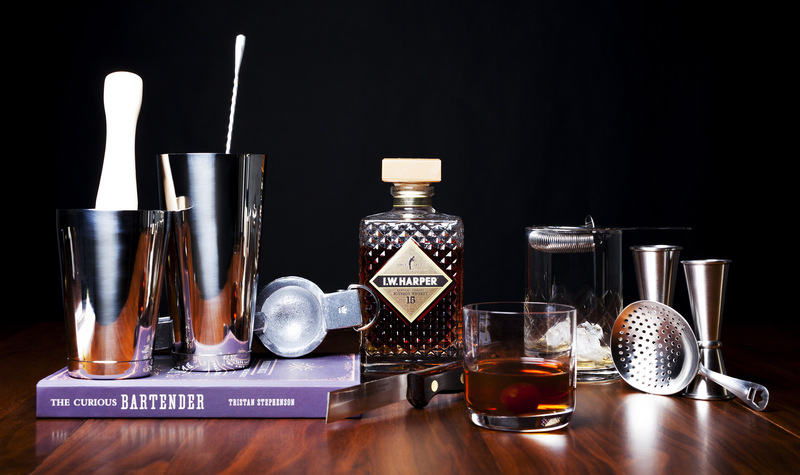 Expert bartender Ryan Victor shows us a few tools with which to mix a proper cocktail from the bar that’s always open—your kitchen. Across the nation, the internet, in film and television, cocktail culture—once lost to us—has returned. America’s rekindled passion is everywhere, from creative takes on the Negroni to a newfound love of molecular gastronomy’s application to the Mojito (see the the Claro Mojito in Tristan Stephenson’s, “The Curious Bartender”). And this passion need not be confined to the establishments which typically provide us such libations. Rather, a man should be able to enjoy a proper drink in his own living room from time to time. American by birth, the cocktail has come home. Crafting great cocktails from home isn’t rocket science, though it does require the right gear. Outside of acquiring some good recipes and spirits, there is some assembly required. And that means picking up a handful of tools to get your home bar off on the right foot. Here are some well rounded basics to get you stirring, shaking, straining, and twisting. And when you’re ready, we very much recommend making a Manhattan, sans pants. What to stir in? You’re going to need a glass stirring pitcher. We’ve selected a Yarai, a lovely Japanese design that’s become an industry standard. Shaken drinks need shakers (unbelievable, but true). A good place to start is a Boston set. 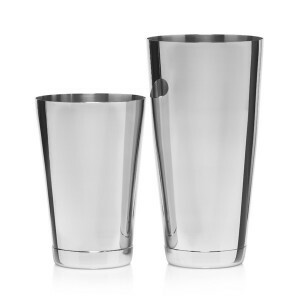 You can shake a tin over a mixing glass – or, as I do, “tin on tin”. You simply use a larger stainless shaker with a smaller one that fits upside down into it. Look for good weighted bases and the right difference in height and diameter so that the smaller fits inside the larger but without being swallowed up. I’m use a fifteen ounce shaker, paired with a thirty. Shaking calls for double straining (as does any drink made with citrus) to ensure all ice chips and pulp stay out of the beverage. 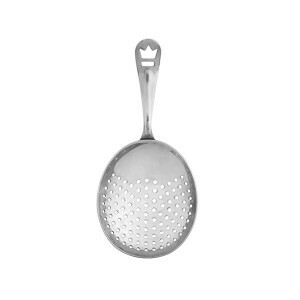 For straining a shaking tin, you should dual strain through both a hawthorne strainer as well as a fine mesh strainer to catch any pulp and ice shards (see our strainer recommendations in the next section). All drinks have recipes, or you’ll be creating your own. 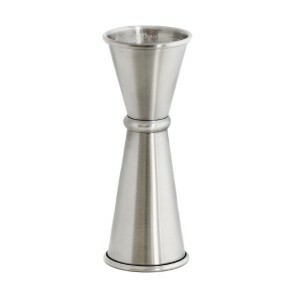 Regardless, you should be measuring your ingredients, for which a jigger is needed. 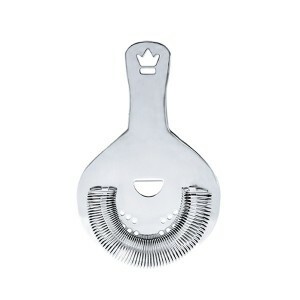 They come any many shapes and sizes, but I recommend the 1 x 1.5oz from Cocktail Kingdom, because it’s graduated by ½ and ¾ oz markings on the inside, making it very versatile. Once you’ve measured your ingredients, you need to mix them up, either by stirring or shaking. The aforementioned Manhattan is stirred. That means a bar spoon is needed. 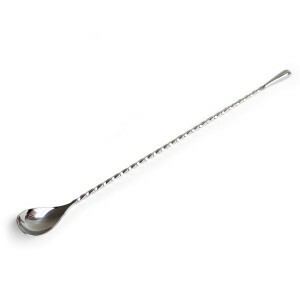 I like a spoon with a nice, tight twist for natural, smooth action. You can go gold if you’re feeling fancy, but simple silver will do. For pressing fruit in a mixing glass or shaking tin, for a muddled ingredient, get yourself a muddler. Wooden muddlers are classic, but cheap ones have a bad varnish that sheds quickly with use, certainly finding its way into your tasty adult beverage. Get this one instead, which has non-treated, non-varnished smooth wood. A paring knife is needed for garnishes or cutting fruit for juicing. A small, serrated utility knife can work well, but a sheaf is generally a good idea. For twists, a peeler or channel knife is needed. All these tools would be of no little use if it weren’t for ice. You’ll need it for chilling and diluting your cocktails, or maybe you’re crushing it for a Tiki drink. Regular ice cubes, or bag ice, will get the job done, but if you’re ever going to make a proper Old Fashioned, you’ll need a proper rock. The best home solution is a Tovolo King Cube ice cube tray. Each tray makes six, 2”x2” ice cubes, a perfect fit for your double Old Fashioned glass. If you’re just starting out, a Hawthorne strainer should do the trick, but if you’re going to be making drinks properly (both shaken and stirred), you should have three (count ‘em–three) strainers: a Hawthorne, a Julep, and a mesh strainer. The Hawthorne is best used with a shaken drink, as it fits perfectly over the opening of your tin. But because shaking vigorously can break ice into small pieces, you should always double-strain through a fine mesh strainer. This also applies to drinks made with citrus, to keep out pulp and seeds. For Manhattans and other stirred drinks (which you’ll be stirring in your glass pitcher), you should strain with a julep strainer. It rests easily in a stirring pitcher and holds ice back more consistently (fewer pieces coming through) than the Hawthorne strainer. While the internet is chock full of tips, tricks, and recipes, leave a little extra space in your liquor cabinet for these two cocktail books. The Ultimate Bar Book will provide technique and principles behind every family of cocktail, as well as detailed descriptions and ingredients for just about every cocktail you can think of. 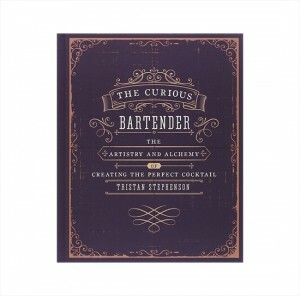 For those looking to up their game and go more in depth, The Curious Bartender offers deep insights into the history and alchemy of mastering the perfect cocktail. 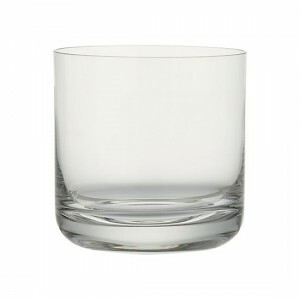 While there are numerous styles of glasses for every type of cocktail, every collection should start with a few good Old Fashioned glasses. 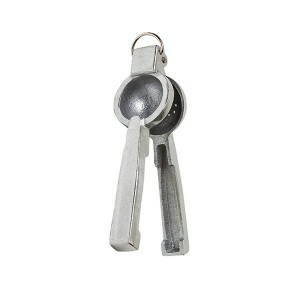 What list of recommended bar gear would be complete without a recipe? Here’s my recommended recipe for the aforementioned Manhattan. 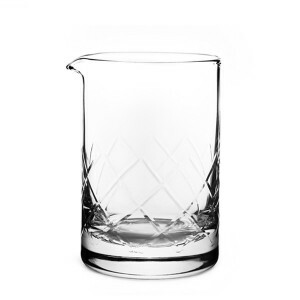 Stir the ingredients with ice in your new pitcher, then strain into your glass with a single large, 2″ ice cube. Cheers!